Giant cell tumor of the peroneal sheath should be considered as a differential diagnosis of lateral foot mass, the peroneal tendons should be examined for subluxation over the peroneal tubercle during resection of the tumor resection of the peroneal tubercle is indicated if the peroneal tendon is subluxable over the tubercle. 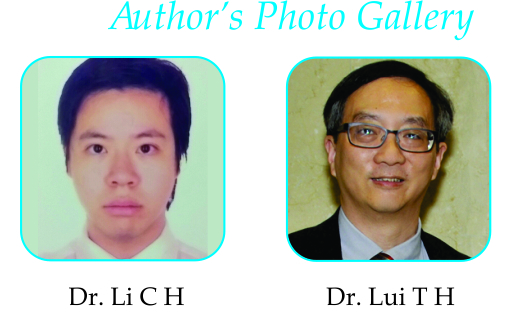 Case Report | Volume 5 | Issue 4 | JOCR Oct-Dec 2015 | Page 68-70| Li CH, Lui TH DOI: 10.13107/jocr.2250-0685.350 . Department of Orthopaedics and Traumatology, North District Hospital, 9 Po Kin Road, Shung Shui. Hong Kong. Introduction: Giant cell tumor of the tendon sheath is most commonly found in the flexor aspect of hand and wrist and is rare in the foot and ankle. Case report: A 49-year-old lady noticed a right lateral foot mass for 10 years. Magnetic resonance imaging suggested that the mass is originated from the peroneal tendons. The mass was excised and intra-operative findings showed that the tumor came from the peroneus brevis tendon sheath. Histological study confirmed the diagnosis of giant cell tumor. Conclusion: Giant cell tumor, although rare, should be one of the differential diagnoses of tendon sheath tumor of the foot and ankle. Keywords: giant cell tumor; peroneal tendons; peroneal tubercle; foot. Giant cell tumor of the tendon sheath comprises approximately 1.6% of all soft-tissue tumors and is characteristically a benign peritendinous fibrous mass[1,2]. There is debate as to whether the tumor is a true neoplasm or a pseudoneoplastic inflammatory response to soft-tissue trauma . This lesion arises from the synovium of the tendon sheath or synovial lining of joints or bursa and is characterized microscopically by synovial cells, histiocytes, multinucleated giant cells, inflammatory cells, macrophages, xanthoma cells, and collagen [1,2]. Grossly, it appears as a rubbery, multinodular, well-encapsulated, grayish tan, brown, orange, or yellow mass; the color depends on the proportion of foam cells and degree of hemosiderin deposition [2,3]. It is most commonly found in the flexor aspect of hand and wrist and is rare in the foot and ankle. In a study of 118 cases of giant cell tumors of the tendon sheath, only 4 cases (3.4%) involved the foot . A case of giant cell tumor of the peroneal tendon sheath around the peroneal tubercle is reported. A 49-years-old lady noticed a right lateral foot mass for 10 years. She had mild discomfort over the mass with shoewear. There was no preceding injury to her right foot. The mass was static in size till 2010 and then mass started to increase in size. Clinical examination showed a 2cmx2cm firm to hard mass over her right lateral heel (Fig 1). The mass was well demarcated with lobulated surface. It was relatively immobile and did not tether to the overlying skin. Tineal sign was negative and the mass was not pulsatile or emptyable. Magnetic resonance imaging showed a T1W intermediate, T2W heterogeneously hyperintense mass in the lateral aspect of her right foot, encasing the peroneal tendons. 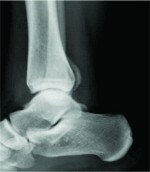 Its long axis aligned with the course of the peroneal brevis tendon (Fig 2). It was believed to be originate from the tendon sheath. Excision of the mass was performed. Intra-operatively, a 3cmx2cmx2cm multi-lobular yellowish mass was found encasing the peroneus brevis tendon midway between the lateral malleolus and the base of the fifth metararsal (Fig 3). After excision of the mass together with the tendon sheaths of the peroneal tendons, the peroneus longus tendon was found to be displaced dorsally and rub over the peroneal tubercle with passive inversion of the foot. The peroneal tubercle was resected in order to prevent delayed tear of the peroneus longus tendon. Histological examination of the mass confirmed the diagnosis of giant cell tumor of the tendon sheath of the peroneus brevis (Fig 4). Upon 37 months of follow up, there was no local recurrence and the patient complained of mild tightness and discomfort over the operative site on walking. Giant cell tumour of the peroneal tendon sheath is rarely reported in the English literature [3,5]. Being rare in foot and ankle, it may sometimes mimic other lesions like lipoma, synovial sarcoma, malignant fibrous histiocytoma, synovial cyst and ganglion . Hence, it is important to include this lesion in differential diagnoses especially if the lesion is presented as a slow-growing longitudinally oriented mass and found to be anchored to any of the surrounding tendons [3,5]. MR imaging is the investigation of choice. Characteristic MR imaging findings include the presence of fibrosis, which is manifested as areas of low signal intensity on all pulse sequences, and hemosiderin deposition, which results in blooming artifact on gradient echo images . Heterogeneous signal intensity may occur depending on the histological composition . The extent of the mass may be obscured by signal intensity similar to muscle on T1-weighted images. However, fibrosis and inflammatory cell infiltrate can result in varying degrees of enhancement as in our patient, which aids in defining the extent of the tumor. The differential diagnosis includes any soft-tissue mass with low signal intensity on both T1-weighted and T2-weighted images, such as a desmoid tumor (particularly for a deep lesion) or pigmented villonodular synovitis, which more commonly involves the larger joints. Aside from possessing similar signal characteristics, giant cell tumor of the tendon sheath also resembles pigmented villonodular synovitis histologically . Actually, giant cell tumour of the tendon sheath is considered by some authors as the extra-articular counterpart of pigmented villonodular synovitis, arising from tendon sheaths, bursae or ligaments . Other differential diagnoses include desmoid tumor, fibroma, cavernous hemangioma, ganglion cyst, granuloma, fibrosarcoma, malignant fibrous histiocytoma, synovial cell sarcoma, chondroma, granuloma, and tophaceous gout. However, none of these entities contain hemosiderin . Local recurrence rate after excision of the giant cell tumor of the tendon sheath can be up to 45% . Complete removal of the affected tissue is of utmost importance in preventing recurrence [3,5,6]. Osseous involvement, radiologically evidenced by the presence of bony erosions is a risk factor for local recurrence . There has been no consensus regarding usage of any post-resection local adjuvants to prevent recurrence although curettage of the involved adjoining bony surfaces and treatment with hydrogen peroxide followed by thorough wash with normal saline and postoperative radiotherapy has been suggested [5-7]. In order to achieve complete excision of the tumor in this patient, the tendon sheaths of both the peroneus longus and brevis were excised together with the mass. The peroneal tubercle was exposed together with the peroneal tendons. It is advisable to perform the intra-operative inversion-eversion test to look for any subluxation of the peroneal tendons over the peroneal tubercle. If it is the case, the peroneal tubercle can be excised in order to avoid the post-operative symptomatic subluxation of the peroneus longus tendon and delayed tendon tear. Giant cell tumor, although rare, should be one of the differential diagnosis of tendon sheath tumor of the foot and ankle. Excision of the giant cell tumor of the peroneal tendon sheath can be curative. The peroneal tubercle should be resected if the tendons are subluxable over the tubercle. 1. LaRussa LR, Labs K, Schmidt RG, Schwamm HA, Schoenhaus HD. Giant cell tumor of tendon sheath. 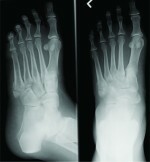 J Foot Ankle Surg 1995;34:541–546. PMID:8646204. 2. Paez H, Vuletin JC, Soave RL, Sellitto RV. Pedal giant cell tumor of tendon sheath. J Am Podiatr Med Assoc 1999;89:368–372. PMID:10423943. 3. Ly JQ, Carlson CL, LaGatta LM, Beall DP. Giant cell tumor of the peroneus tendon sheath. AJR Am J Roentgenol. 2003;180:1442. PMID:12704065. 4. Jones FE, Soule EH, Coventry MB. Fibrous xanthoma of synovium (giant-cell tumor of tendon sheath, pigmented nodular synovitis). A study of one hundred and eighteen cases. J Bone Joint Surg Am 1969;51:76 – 86. PMID:4303016. 5. Goni V, Gopinathan NR, Radotra BD, Viswanathan VK, Logithasan RK, Balaji S. Giant cell tumour of peroneus brevis tendon sheath – a case report and review of literature. BMJ Case Rep. 2012, 2012.PMID:22802558. 6. Kotwal PP, Gupta V, Malhotra R. Giant-cell tumor of the tendon sheath: is radiotherapy indicated to prevent recurrence after surgery? J Bone Joint Surg Br 2000;82:571–573.PMID:10855885. 7. Reilly KE, Stern PJ, Dale JA. Recurrent giant cell tumors of the tendon sheath. J Hand Surg Am 1999;24:1298–1302. PMID:10584957.